After his graduation from college, Thomas Ollenburger is filled with big dreams and many questions. What will he do for a career? Should he marry? Where will he call home? Torn between his Mennonite roots on the Kansas prairie and his love for the big city of Boston, as well as his affection for a girl in each location, Thomas is unsure of his place in the world. He has always sought God's leading in his decision-making, but now it seems as if God is staying silent. Has Thomas's heart led him astray? 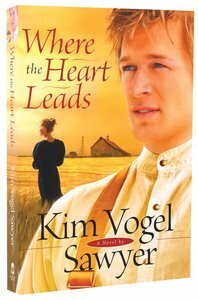 About "Where the Heart Leads"
Bestselling, award-winning author Kim Vogel Sawyer wears many hats besides 'writer.' As a wife, mother, grandmother, and active participant in her church, her life is happily full. But Kim's passion lies in writing stories of hope that encourage her readers to place their lives in God's capable hands. An active speaking ministry assists her with her desire. Kim and her husband make their home on the beautiful plains of Kansas, the setting for many of Kim's novels. Customer Reviews For "Where the Heart Leads"
"Where the Heart Leads" is a follow-up book to "Waiting for Summers Return" where we once again meet Thomas Ollenburger... this time as he is finishing college and searching for his path in life. Once again Kim Vogel Sawyer had me captivated, cheering within myself for Thomas to choose the right path, and at times cringing as he struggles with choosing between following his heart, or being bound by tradition. I truly couldn't put it down... reading until the early hours of the morning! A wonderful story that tackles race and social barriers, and showing that the love of Christ really does cover all.